Vladimir Putin and Recep Tayyip Erdogan have been meeting in Sochi to discuss issues of common interest, including the conflict in Syria. Euronews correspondent Galina Plonskaya is in Moscow to talk to Dr Victor Nadein-Raevsky, Director of the Black Sea Caspian Region Institute of Political and Social Research, about the relationship between the two countries. “Of course Erdogan has come to Russia to continue developing our relationship. Turkey is interested in a very broad cooperation with us on a range of issues. In agriculture, they want a complete re-establishment of the previous relationship. In the construction sector, they want the import of Turkish industrial products. On another issue altogether – Syria – the Turkish side wants security for their borders, for Turkish Kurdistan. And besides that, there’s the question of military collaboration. In addition to all this, the issue of Nagorno Karabach has been raised. The Turks want to talk about it and they would like to take on the role of a mediator. But the Armenians aren’t ready for that. 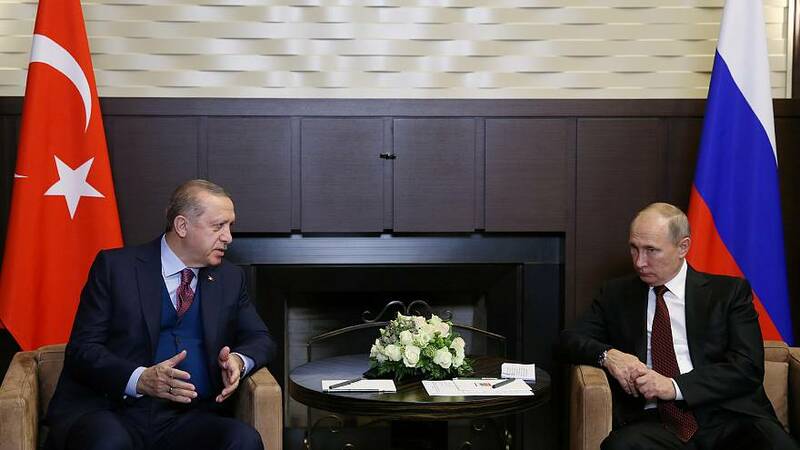 Putin’s meeting with Erdogan has been seen as a thaw in relations between the two countries in the wake of tensions following Turkey’s downing of a Russian warplane back in 2015.